Network Marketing and Direct Selling companies in India are facing a lot of problems while operating in the Country. The current provision of criminal proceedings in the case of discrepancies is hampering the growth of these companies in India. Hence these Direct selling companies have urged the Indian Government to extend protection under the Consumer Protection Act. QNet said,“Certain individuals have been filing criminal complaints directly with the state police, without even attempting to contact the concerned company for resolution first,” in response to the guidelines issued in September 2016 by the Ministry of Consumer Affairs. QNet urged the customers to approach the concerned company first in case of any complaints about the products. However, currently, this is not happening. The customers are registering complaints with local police without even seeking for resolution with the concerned Direct Selling Company first. 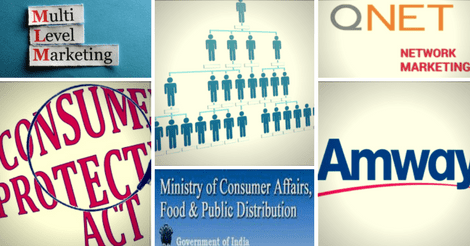 In response to the draft guidelines of the ministry, QNet has submitted its affidavit to the Ministry of Consumer Affairs. Its Indian franchisee Vihaan Direct Selling (India) Pvt Ltd, submitted the affidavit on behalf of Qnet Chief Executive Officer of QNet Ltd, Trevor Kuna said. According to the sources, Amway, Mediocre, Herbalife, Tupperware and Oriflame have filed affidavits to the Ministry of Consumer Affairs. These companies are also into Direct Selling Industry. Billiards champion Michael Ferreira and Vihaan’s Indian shareholder got a bail from the Supreme Court last week. He was earlier arrested on criminal charges in September 2016. The Karnataka High Court also stated, “Criminal law cannot be set in motion to settle civil disputes by giving the color of criminality.”But due to the lack of regulation, various courts have enforced acts like the Maharashtra Protection of Interest of Depositors (MPID) Act and the Price Chits and Money Circulation (Banning) Act (PCMC), and categorized the complaint under criminal offenses. An industry player has urged all the other industry players and industry bodies to come and work together on a common platform with the Ministry of Consumer Affairs to convert these guidelines into legislation. The Supreme Court while granting bail to Ferreira said that Direct Selling is not a Ponzi scheme. Direct Selling Industry in India accounts to approximately $1.18 billion in revenues in 2015. It is 22nd in the list of top 25 countries in the world. As per a FICCI – KPMG report, around four million people are earning their livelihood from this industry in India. This figure is only expected to grow by 2025 to approximately $9.8 billion.